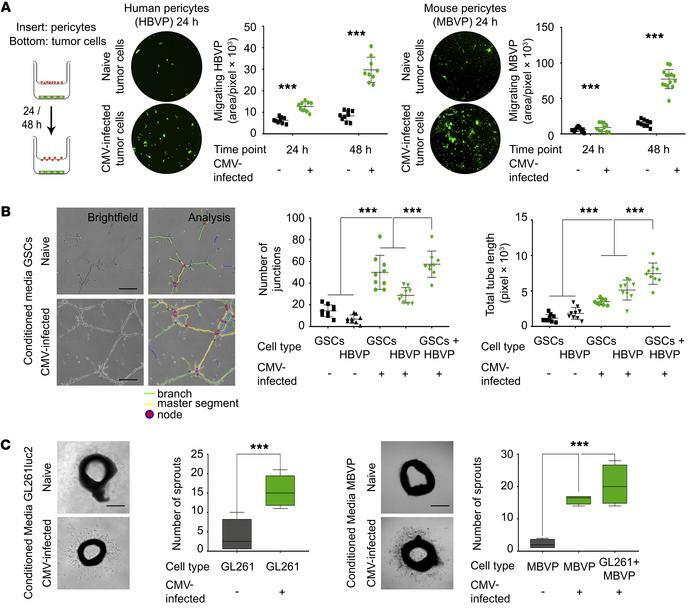 Conditioned medium from CMV-infected GBM cells increases pericyte migration and endothelial cell tube formation. (A) Transwell migration of HBVPs and MBVPs. Data are presented as mean ± SD. ***P < 0.005, Holm-Šídák test. (B) HBMEC tube formation on Matrigel performed in the presence of conditioned media from HCMV-infected human GSCs or HBVPs. Data are presented as mean ± SD. ***P < 0.005, Holm-Šídák test. (C) Aortic ring assay performed using conditioned media from uninfected and CMV-infected GL261Luc2 cells or MBVPs. Graphical representation shows number of sprouting vessels. Data are presented as box and whisker plot. Box extends from 25th to 75th percentile, and median is indicated by horizontal line. Whiskers represent maximum and minimum values. ***P < 0.005, 2-way ANOVA. Scale bars: 50 μM (B); 1 mm for (C).